BerwickBandits.co.uk are running a Fantasy League this season and are looking players. First prize is a watch from Taffy's Time Machine. Full details are on the site. A new Polish speedway site looks like an interesting addition to our links list. Speedway Poland is written in English and promises the latest results and news from Polska. There's now a second website devoted to the much-missed Middlesbrough Speedway. Ron "Too Small" McNeil's new site has a strong statistical flavour but will be of great interest to many. We turned the spotlight on Middlesbrough a while back, read our thoughts here. Our links to other stadia pictures seemed to go down well last week. Plenty of questions were also raised about both Cowdenbeath and Newtongrange in particular. Hopefully our new Non-Essential Guide to Cowdenbeath Speedway will answer at least some of those. Anybody able to do us something similar for Newtongrange? Wimbledon teamster Andre Cross is also a champion Cycle Speedway rider. Find out more at his new website. The former Canterbury rider (1981-82) now runs a licensed cafe in Tailem Bend (near Adelaide). His 13 year old son Sam is a promising rider with ambitions to race in the UK. We're looking for volunteers to take part in a new series of 'A Matter of Opinion'. It's a straightforward concept - we ask you five questions and you give us five answers. You can check out some previous editions here. Getting involved couldn't be simpler - just drop us an email telling us a little about yourself e.g. your local track, how long you've been following the sport and any aspects of the sport of particular interest to you. 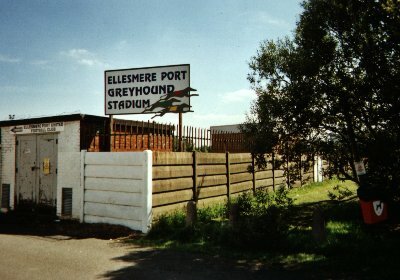 It's been 18 years since Speedway was last staged in Ellesmere Port but the stadium still stands in Thornton Road. It's now used for football and greyhound racing. View the pictures. Thanks to Clive Aitken for submitting a couple of pictures of the Arena Essex track. You can view these here. More pictures of current or former venues are always very welcome. John Millis is looking for information on a chap called Wally Thorne. Wally was apparently both a rider and tuner in a by-gone era. Can anyone help? Similarly, Peter Merison wants to know more about Fred 'Kid' Curtis the former Newcastle and West Ham rider. Get in touch if you can help. Opinion seems divided on the BSPA's decision to allow all Premier League riders to 'share' Elite League berths next season. This new arrangement offers many positives, a number of negatives and throws up a whole number of questions. We take a look at some of these now. Young riders will continue to get some exposure to Elite League racing without leaving the security of the Premier League. Previously these opportunities were restricted to British kids, now everyone will benefit. Riders like Adam Shields, Magnus Karlsson and Kenneth Bjerre all spring to mind as likely beneficiaries. There will be less need for teams to recruit low quality foreigners to fill up team slots. This should reduce the travel bill that some clubs face. The quality of racing in the Elite League should be enhanced, some of the guys doubling-up will be far more competitive than some of the 'rabbits' tracked in recent seasons. Riders are going to be unavailable on a large number of occassions. We experienced this last season when both riders sharing a reserve spot were missing, they were typically replaced by guests. This will be a frequent occurrence next season. The British League Cup is already shaping up to be farcical. Elite League clubs are going to be without their Grand Prix stars and, presumably, their Premier League riders. We guarantee now that some of the line ups in this competition will be a complete joke. The move seems to count against riders presently racing in the Elite League. Stuart Robson for example, assuming he stays at Coventry, could take part in around 40 official meetings fewer than Carl Stonehewer. Thanks for toughing it out in the Elite over the last few seasons Stuart! Will Premier League commitments always take precedence over Elite League meetings? For instance would Joonas Kylmarkorpi ride for Arena in a meaningless league match if Eastbourne were racing a play-off on the same night? If not, what do Arena do on such occassions? Will riders doubling-up continue to carry two separate averages or a composite one? If it's a composite one then there would seem to be room for results to be 'surprisingly' poor in one league in order to suppress the average that applies in the other. If a Premier League rider averages more than six in the Elite League, does he then become ineligible to race in the 2004 Premier League? If not, could Adam Shields continue to race in both Leagues for as long as he wants - even if he were to become World Champion? We would welcome your thoughts on this topic. The teams for 2003 are now really taking shape. Over the last couple of winters we've run a feature that shows the current state of the teams, unfortunately we're unable to provide this service this year. ReadingSpeedway.com is however maintaining a list of the all confirmed signings in both the Elite and Premier Leagues. A new unofficial site for Ipswich has hit the web. The Witches have always been poorly represented on the web so this will be a popular addition. Check it out by clicking here. The former Newcastle, Middlesbrough and Halifax star now runs a business in Melbourne that sells All Terrain Vehicles. (Website). Ryan Platten has been in touch to plug his new 'SpeedWeb' website. It's fairly basic at present but does include some photographs by Graham Platten (a relation we presume). These pics mainly feature Berwick riders. There's also the ability to print off blank GP and League scorecharts. SpeedWeb can be found at http://speedweb.tux.nu. Young Aussie Ben Powell has a new personal website. The Sheffield youngster looks a good bet for a PL team spot next season and this will be the place to keep up with this progress. Point your browser at http://www.benpowellracing.co.uk/. Nostalgia still rules here at Speedway Plus. Our new "Flashback" series will concentrate on the stories the made the headlines in a particular month. We start with a look back to August 1987. Good luck to Brian White in his continuing efforts to open a new track in Dorset. Brian was the man behind the Weyport Warriors venture last year but has now switched his attentions to Chickerell (near Weymouth). More details on their new website. Great to see that Les Collins is back in the sport after signing for Glasgow. The old boy is still the ultimate entertainer and his enthusiasm can never be doubted. Welcome back Les. There's talk that Scunthorpe could be back in the sport in the next year or so. Richard Hollingsworth was a former fan of the Stags and has submitted the following Dream Team. Workington have raced at Derwent Park on and off since 1970. The North-West Rugby stadium is old-fashioned by modern standards but still compares favourably to many tracks around the country. See for yourself in our picture feature on Derwent Park. New Swindon signing Oliver Allen is the latest rider to boast a personal website. It's a well presented effort that contains the usual profile, galley and news sections. The domain name is www.oliverallen.co.uk. Super-enthusiast Tom Haines is now running an unofficial Grand Prix site. The popular Speedway dice game 'Speedway Scene II' has been converted into a new PC game. Check out 'Flying Shale' here. The movie mystery we mentioned on 20th October has now been solved. Apparently the film in question was 'Bronco Bullfrog', this British production was made in 1969. Get in touch with any recollections you may have of the film. Sheffield's victory in the Young Shield brings the 2002 season to a close. Rather predictably, we now take the opportunity to review the events of the last eight months in our summary of the season. Newport fans are already well served on the web but yet another Wasps site has hit the net. Wasps Galore can be found at http://www.expage.com/waspsgalore. Treble winner Andrew Moore has had a personal website for a while but it wasn't on our links page. It is now. We're still collecting Dream Teams and the ones previously submitted will be back on the site soon. Ideally we like to know the reasons for each selection but it's not compulsory. The mysterious 'Pinstripe' fancies seeing the following riders racing as a team. Graham Morris has been in touch with regards to our 'Speedway On Screen' feature. He reckons there's one we've missed. Graham takes up the story - "A few years ago I remember watching some sort of gritty drama where a teenager goes to Hackney speedway at one point and sits on a bench on the first bend. I can picture that one scene, but absolutely nothing else about the movie whatsoever". Does that ring any bells with anyone?, if so please get in touch. Adam Skornicki has got a typically flamboyant new website. Point your browser at www.adamskornicki.com. It seems a site for a potential new stadium on Teeside has been identified. More details at Cleveland Parklife. Let's hope it's the breakthrough the Boro Bears fans have been waiting for. We've made a start at re-introducing the stadia pictures to the site. More will follow, including some new ones, in the weeks ahead. Trelawany star Emililano Sanchez has a new website. Check it out at www.emilianosanchez.co.uk. A feedback form has now been added to the bottom of each page. Please use this to let us know your thoughts on the site or to let us know of any new links we should be adding to our links page. Regular visitors will notice that the site is currently undergoing something of a makeover. This follows a comprehensive review of the purpose, design and content of this site. As a result there are likely to be fewer updates to the site in future but the hope is that the quality of content will improve as a result. To this end we are looking to recruit additional contributors who have something to say on the past, present or future of the sport. Those interested should make contact via the address above.